Stanford scientists have identified a small group of neurons that communicates goings-on in the brain's respiratory control center to the structure responsible for generating arousal throughout the brain. It's a question that has never been answered by science, until now. A paper describing the findings were published March 31 in Science. Mark Krasnow, MD, PhD, professor of biochemistry, is the senior author. The lead author is former Stanford graduate student Kevin Yackle, MD, PhD, now a faculty fellow at the University of California-San Francisco. Medical practitioners sometimes prescribe breathing-control exercises for people with stress disorders. Similarly, the practice of pranayama—controlling breath in order to shift one's consciousness from an aroused or even frantic state to a more meditative one—is a core component of virtually all varieties of yoga. "This study is intriguing because it provides a cellular and molecular understanding of how that might work," Krasnow said. "The respiratory pacemaker has, in some respects, a tougher job than its counterpart in the heart," said Krasnow, who is also a Howard Hughes Medical Institute investigator. "Unlike the heart's one-dimensional, slow-to-fast continuum, there are many distinct types of breaths: regular, excited, sighing, yawning, gasping, sleeping, laughing, sobbing. We wondered if different subtypes of neurons within the respiratory control center might be in charge of generating these different types of breath." On that hunch, Yackle searched through public databases to assemble a list of genes that are preferentially activated in the part of the mouse brainstem where the breathing-control center resides. This center's technical term is the pre-Bötzinger complex, or preBötC. Now the scientists could systematically assess the role of each neuronal subpopulation in laboratory mice. With advanced technologies, they could selectively destroy any one of these neuronal subtypes—and only that subtype—based on its unique signature of active genes. Then they could observe how this particular subtype's loss affected the animals' breathing. In 2016, in collaboration with Feldman, they succeeded in isolating a subpopulation of neurons in the preBötC that explicitly controls one type of breathing: sighing. Knocking out these neurons eliminated sighing but left other modes of breathing unaffected. The discovery was published in Nature in 2016. But once these rodents had their Cdh9/Dbx1 neurons eliminated, they seemed to take the loss in stride. Unlike their sigh-deprived brethren, there was no lacuna in these mice's portfolio of breathing variations. "I was initially disappointed," said Yackle. But a few days afterward, he noticed something: For mice, the animals were extraordinarily calm. "If you put them in a novel environment, which normally stimulates lots of sniffing and exploration," Yackle said, "they would just sit around grooming themselves"—evidence of what passes for mellowness when you're a mouse. Further analysis showed that while these mice still displayed the full palette of breathing varieties from sighs to sniffs, the relative proportions of those varieties had changed. There were fewer fast "active" and faster "sniffing" breaths, and more slow breaths associated with chilling out. The investigators surmised that rather than regulating breathing, these neurons were spying on it instead and reporting their finding to another structure in the brainstem. This structure, the locus coeruleus, sends projections to practically every part of the brain and drives arousal: waking us from sleep, maintaining our alertness and, if excessive, triggering anxiety and distress. 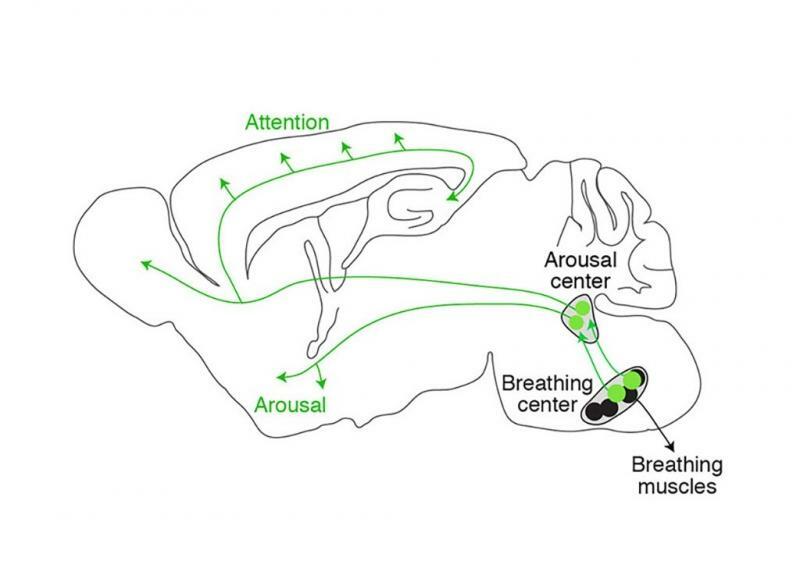 It's known that neurons in the locus coeruleus exhibit rhythmic behavior whose timing is correlated with that of breathing. In a series of experiments, the Stanford researchers proved that the preBötC neurons that express Cadh9 and Dbx1 not only project to the locus coeruleus—a new finding—but activate its long-distance-projections, promoting brainwide arousal. 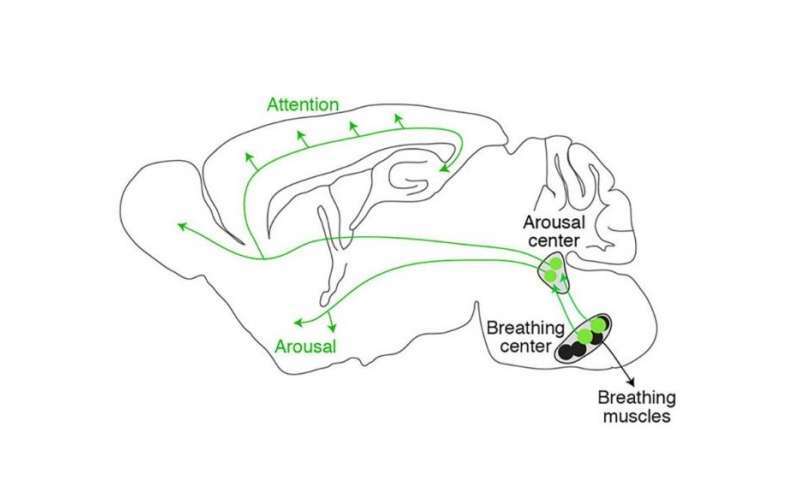 "The preBötC now appears to play a key role in the effects of breathing on arousal and emotion, such as seen during meditation," said Feldman. "We're hopeful that understanding this center's function will lead to therapies for stress, depression and other negative emotions."